Tourmaline is famous for its enormous range of colors. Though tourmaline can be found in virtually every color in the spectrum, the rarest tourmaline color is blue. The blue tourmaline that has attracted the most attention is the super rare paraiba variety that was first discovered in Brazil in 1989, and then later in Nigeria and Mozambique. These gems, colored by copper, have an unusual neon-like quality that is coveted by collectors. But all blue tourmaline is rare, even the non-copper-bearing specimens. Bluish tourmalines -- often referred to under the name Indicolite -- are colored by iron. A pure blue is extremely rare, and most indicolites will have some green secondary hue. A teal or blue-green color would be most typical. The purer blues will tend to be found only in small sizes, often under 1 carat. Larger stones will tend to have a stronger green component. Like most tourmaline, it is strongly pleochroic, meaning it shows different hues when viewed from different directions. An Indicolite will appear significant darker when viewed down the C-axis of the crystal, as you can see in the video above. This must be taken into account when cutting the material, so the gem shows the best color when viewed face up. Poor cutting can result in a loss of transparency and brilliance, especially in darker specimens. Most of our blue-green tourmaline is of African origin, with fine material coming from Nigeria and Mozambique. There is also some notable indicolite from Afghanistan. Recently we have cut some beautiful material from Brazil, with a saturated teal color with blue flashes. This month we feature some exciting new additions to our collection, including Blue Green Tourmalines from Brazil, Purple Garnet from Mozambique and Tanzanite from Tanzania. An impressive teal green Tourmaline with blue flashes! This long elegant pear has wonderful brilliance and fire. At over 30 mm in length, it will make a stunning pendant. Guaranteed natural and untreated. A superb neon blue tanzanite over 6 carats! This gorgeous oval has a rich sapphire-blue color that is rare in tanzanite. This gem has been precision cut to bring out the full potential of this beautifully clean material. Guaranteed natural. We have just cut this gorgeous matched pair of top Royal Purple Garnets from Mozambique! This is beautifully clean material with a vivid open color and a dramatic color change. These are some of the finest garnets we have ever seen, and a must buy for the gem collector. Guaranteed natural and untreated. An exceptional Bi-Color Tourmaline from Nigeria with a lovely color combination, grading from vivid pink to green with gold highlights. Completely clean and fashioned in a precision scissor cut, this top gem tourmaline will set up beautifully in your jewelery design. Guaranteed natural and untreated. A lovely matched pair of gem Morganites from Brazil in pastel salmon pink. Fashioned in elegant cushions over 4 carats each, these will make a splendid pair of earrings. Guaranteed natural and untreated. A stunning teal green Tourmaline with blue flashes! This is beautifully clean material with superb color saturation and wonderful brilliance. Expertly fashioned in a precision emerald cut, this fine Tourmaline is perfectly sized (12 x 10 mm) for an impressive ring. Guaranteed natural and untreated. A ring bought at a flea market in the UK in the 1980's for $13 was sold to a buyer at Sotheby's June auction in London for $847,667. The seller had acquired the ring at an informal sale in the UK, assuming it was costume jewelry. It turned out to be a genuine 26.29 carat VVS2 clarity diamond. One of the finest emeralds in the world was purchased by Harry Winston at Christie's auction in New York in June. 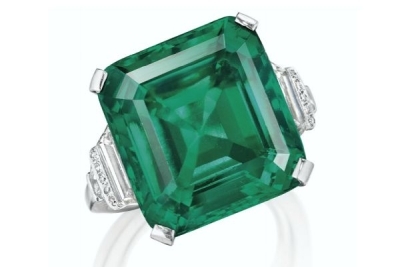 The price paid for the 18.04 ct step-cut octagon emerald ring was $5.5 million. The gem was originally owned by John D. Rockefeller, Jr., who acquired the stone in 1930 as the center stone for a brooch for his wife. When she died in 1948, their youngest son, David Rockefeller, inherited the emerald and instructed designer Raymond Yard to set it in a ring. The piece later passed from the family into private ownership. The San Carlos Apache reservation in Arizona produces about 80% of the worldwide supply of peridot. It is mainly low quality material and most of the production is used in inexpensive commercial jewelry. The color of the Arizona material tends to be a less saturated yellowish-green, and most of the rough stone yields polished gems under 1 carat. Most of the material is heavily included as well. The Chinese peridot is found in Hubei province, northwest of Beijing. Interestingly, the geological origins and gemological properties of the Chinese peridot is almost identical to the Arizona peridot; both formed in volcanic lava flows and are found as tiny crystals embedded in basalt. The Burmese and Pakistani peridot tend to have a purer grass green hue and can be found with excellent transparency in larger sizes. Historically, Burma has been the main source for superfine peridot, but a significant deposit of top grade material was found in Pakistan in the late 1990's. Though we still have some excellent Burmese peridots in our collection, there seems to be very little new Burmese material in the market, and most of the top peridot seems to be coming from Pakistan.